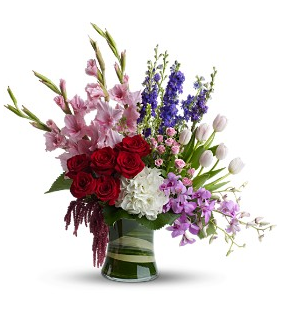 Our Customers tell us that we are the best florist in town. Here are a few of the kind letters that we have received over the years. I want you to know what a terrific shower we had and thanks to you, lots and lots of compliments! Thanks so much for getting the flowers to my daughter on her Birthday. She was really happy with them. The flowers: the bouquet, the flower girl basket, the boutonnieres, and the corsages and the flowers for the attendants were fabulous. I loved it! My bridal bouquet is (still) so beautiful!! You, Girl, are WONDERFUL beyond measure. The gushing comments about both the flowers/decorations and the food are just so smile producing. Will get on your site to register a comment - just not quite there yet - lots to take care of. The way you handled thetable decorations was just so much more than I expected - really exquisite. Thank you, thank you - talk with you soon. I just received a call from Mr. Matalon who says his wife LOVES the arrangement (he thinks even more than she loves him!!) – he is delighted and really happy so once again thank you so much, you guys made it all very easy for me.. Thank you so much! The Flowers were perfect – just the way I pictured everything. Thanks for making our wedding beautiful. My wife, Barbara loved the long stemmed red roses; they were beautiful! It was a perfect way for the mid week celebration of her birthday. Talk about a tax planning CPA: A spouse whose birthday is the day before Tax day! It’s worked as we have been happily married for over 33 years! Anyhow, thanks for your exemplary service and product. I will call you again for our next special occasion. Thank you for making me a stunning bridal bouquet in such short notice and bless your heart for delivering it one New Year’s Eve! Your thoughtfulness means a great deal to so many people. Others could learn from you. Special Prayers are said for our "Home Town Hero"! Thank you so much for leading our flower arranging class on Sunday. Your expertise, creativity, flexibility and resourcefulness combined to make a perfect class. Your gift of time given so graciously is very appreciated. Thank you so much for your wonderful flower design! It was everything I wanted and more! We loved all the arrangements! Call me if you would like photos! Thanks! Thank you so much for the beautiful orchid. We have received many compliments. Like always your arrangements are second to none. Thank you so much for the lovely flower arrangement. We are excited to be neighbors and look forward to a wonderful future in Cutler Bay. I have never seen prettier flower arrangements than those at my own wedding! Your work was absolutely gorgeous, and all the arrangements were flowing with beautiful colors. Thank you so very much for your time and efforts. Everything was perfect! And the gardenias were a dream come true! Just wanted to say thank you for the beautiful floral arrangement you created for my son's funeral in June. It was just a perfect tribute to Michael and a comforting focal point at the service. Everyone commented on your creation as a "work of art". Thank you so much for your support and generosity. The flower arrangements were beautiful. The PTA and Vineland appreciates your continued support. After you helped me the other day, I found myself thinking about what a great help you’d been and what a great attitude you had! As someone who is also in the service business I thought you might like to know that you stand out from the pack. Exceptional businesses are always made up of exceptional people and Blooming Gardens is lucky to have you! I won’t hesitate to recommend you to all my friends and clients. I can't believe how beautiful everything looked! I was amazed! You and your staff did a wonderful job! Such vibrant colors! after everything was over I gathered what was left and took as many pictures as possible! I had no words when I saw what you had done, you made a beautiful event! Thank you for arranging the flowers the flowers for my wedding. They all came out so beautiful, especially with all your family events happening at the same time. I’ll be keeping you in mind for my next event. Sorry for such delayed message but I ABSOLUTELY LOVED the flowers!!! You did an AMAZING job!!! Everything was beautiful the corsages the boutonnieres my bouquet and the bridesmaid bouquets as well!